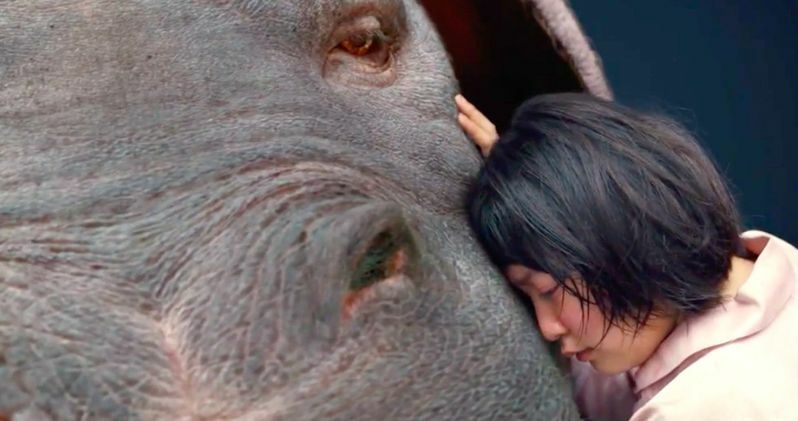 Netflix has revealed the official trailer for their highly-anticipated film Okja, which includes the first full look at the massive animal at the heart of director Bong Joon Ho's latest film. Okja will have its world premiere at the 70th Cannes Film Festival, before it launches globally on the Netflix streaming service June 28. Director Bong, a visionary director and one of the world's greatest storytellers, has assembled an esteemed international ensemble cast that includes Tilda Swinton, Paul Dano, Byun Heebong, Steven Yeun, Lily Collins, Giancarlo Esposito, Jake Gyllenhaal and introducing An Seo Hyun as "Mija"
For 10 idyllic years, young Mija (An Seo Hyun) has been caretaker and constant companion to Okja, a massive animal and an even bigger friend, at her home in the mountains of South Korea. But that changes when a family-owned multinational conglomerate Mirando Corporation takes Okja for themselves and transports her to New York, where image obsessed and self-promoting CEO Lucy Mirando (Tilda Swinton) has big plans for Mija's dearest friend. With no particular plan but single-minded in intent, Mija sets out on a rescue mission, but her already daunting journey quickly becomes more complicated when she crosses paths with disparate groups of capitalists, demonstrators and consumers, each battling to control the fate of Okja...While all Mija wants to do is bring her friend home. Deftly blending genres, humor, poignancy and drama, Bong Joon Ho (Snowpiercer, The Host) begins with the gentlest of premises, the bond between man and animal, and ultimately creates a distinct and layered vision of the world that addresses the animal inside us all. While production was under way in Korea, this Netflix movie started making headlines for the casting of Steven Yeun, who was filming Okja while his hit zombie series The Walking Dead was still in production. At the time, fans didn't know that his character Glenn Rhee had been killed off, since the Season 6 finale cliffhanger didn't reveal the identity of the character killed by new villain Negan. Many had assumed, correctly, that the actor's casting ultimately signaled the death of this beloved character, which was eventually confirmed in the Season 7 premiere. Bong Joon Ho directs Okja from a script he co-wrote with Jon Ronson (The Men Who Stare At Goats, Frank). Okja is produced by Brad Pitt's Plan B Entertainment, along with Lewis Pictures and Kate Street Picture Company, in association with Netflix. Okja will premiere exclusively on Netflix on June 28. In addition to the new trailer for Okja, we also have the first poster, which you can check out below the trailer.